Last week we hosted the final of our ‘Unrestricted View’ report-back sessions on our Theatre Spectatorship project – this time at the Young Vic in London. As part of our research, we surveyed and interviewed audiences of three Young Vic shows: The Secret Agent, Happy Days and The Events so we were delighted to be back at the theatre. It was an enjoyable meeting and a good opportunity to share some of our provisional findings with members of the public. Alan Stacey (Executive Director at the Young Vic) and Stacy Coyne (Marketing and Digital Manager) were able to join us and it was useful to hear their responses to our presentation. We focused some of commentary on audience feedback from the Young Vic. There’s some evidence that spectators at the Young Vic may be slightly more balanced in gender than the other theatres we sampled; they are also strikingly educated, with the majority of our self-selecting sample having a postgraduate qualification – though, of course, this may tell us more about the willingness of postgraduates to complete questionnaires! There are other mitigating factors which need to be factored in: Alan mentioned, quite rightly, that the audience demographic would have been very different if we’d looked at, say, the production of Feast (2013). These sorts of variables are an inevitable feature of audience research and they require us to be cautious in the claims we make about audience constituencies and profiles. There was a fascinating discussion about how theatre audiences might be engaged more effectively in a long-term conversation about the shows they see. Stacy commented that our project encourages theatres to reflect on how they think of audiences before and after the show, and about how they might foster qualitative discussion with audience members over longer periods of time. The Young Vic has been energetic in engaging audiences in innovative ways across multiple media platforms: for example, they have made a series of films (‘YV Shorts’) to accompany their productions. These are available online to give people who can’t get a ticket an experience and they also foster debate around the show and enhance its topicality (see http://www.youngvic.org/YVshorts). These sorts of initiatives have the potential to transform the ways that spectators engage with productions – and each other. We were asked a question about the connection between remembering, thinking and value attribution. Do audience members value a piece of theatre more if they have chance to discuss it? Our questionnaires, in encouraging audience reflection before, immediately after and two months after seeing a show, might in fact be doing a job that theatres might want to take on – that is, encouraging on-going thoughts about the theatre. One of our attendees suggested that audiences may want greater ownership of interpretation. The post-show discussion or ‘in conversation’ public platform are the conventional means of engaging an audience in dialogue about what they have experienced in the theatre. But perhaps this format is now too tired, too limited? What other strategies are possible so that reflections can be deepened, shared or sustained over longer periods of time? All three ‘Unrestricted View’ events – in Stratford, Plymouth and London – have opened up inspiring conversations and insights. They have been very much part of the research process and will inform the completion of our Final Report. Thank you to all who attended these events. At the second of our report-back events, David Miller (Plymouth’s Production and Technical Director) welcomed us and Janelle Reinelt opened the session, placing our work in the context of the cultural value debate and emphasising that this event was part of a work in progress; as well as contributing to the conversation this evening, attenders were encouraged to visit the website and contribute to the debate online. Plymouth’s audience insight officer Ed Borlase confirmed that the company’s survey work had become much more qualitative over time. The first questioner asked him if the theatre’s surveys influenced programming; he confirmed it did. Artistic Associate David Prescott confirmed that audience feedback was an important part of the theatre experience being offered by the company; every show has a post-show discussion. David questioned our decision to show spectators’ moving from a sensual to a cognitive response by a graphic including a descending arrow. Wendy Haines reported on the interviews she’d conducted for the project. She was struck by how willing people were to talk about their theatre experience, sharing deep and sometimes intimate responses to the shows they’d seen. She was struck by how the Plymouth audience valued going to the theatre (other attenders commented on how far people drive to come to the theatre). Confirming our survey findings, Wendy had found a huge emphasis on the communal aspect of the experience. A lot of people who attended the Drum defined their theatre taste against that of the main house audience: “I don’t tend to go to musicals”. Attenders suggested it might have been interesting for us to survey audiences for musicals. David Edgar talked about the role of workshops in the research process: encouraging people to write scenes based on the work they’d seen enabled them to articulate connections with their personal lives which it would be hard for them to express directly. A questioner asked how audiences used the values they gained from theatre. Dan cited answers to our question about things that people were reminded of in their own life, but the questioner persisted: he was asking about real impact and outcomes. Janelle said that we didn’t want to pose leading questions, or go back down an instrumentalist road. Another questioner raised the “entertainment” category, confirming our view that it’s a much wider category than academics tend to think: “Wolf Hall was entertaining, but you don’t half have to think”. A final questioner made what he called a “fuzzy point”: the Romans subsidized bread and circuses to deflect the populace from rebellion – was theatre doing the same thing? Some attenders raised the issue of the “Drum audience” and how it differed from the mainstream, main house audience. Dan challenged the idea that different spectators responded differently to different shows: the value that audiences placed on liveness, for example, went across the board. Last autumn, I attended a conference on audience participation at the ICA. Organised by the University of Kent, the first afternoon consisted of nine papers, each presented by a standing person (or persons) to a silent, seated audience. There was no time for discussion or questions. The organisers wrily acknowledged the irony of this, assuring us that things would be more participatory tomorrow. Although there were differences of opinion, the line of the day was that the point of audience participation was to challenge the idea of the single author (the conference was subtitled “on audience and authorship”). As journalist and critic Catherine Love put it: “Once we recognise the role of an audience in actively crafting interpretations, can we continue to locate the generation of meaning in theatre with a sole author?”. For me, the presentations had an element of déjà vu. When I began in theatre, in the early 70s, a considerable amount of audience participation was an unintended consequence of the 1968 abolition of theatre censorship (which, among other things, made improvisation impossible). Planted audience members – which go back, at least, to Clifford Odets 1937 Waiting for Lefty – appeared in John Osborne’s 1972 A Sense of Detachment and elsewhere. The Traverse Theatre Workshop’s U2 was a promenade show for a single audience member (who didn’t know that when they booked). In Joint Stock’s 1974 The Speakers, the audience chose which Speakers’ Corner didacts should rant next (and heckled them). The Living Theatre 1969 season at the Roundhouse involved an invitation to the audience to strip off and join in. My own work at the time included a play in which the course of the action was chosen by an audience vote, and another in which the outcome was decided nightly by the decision of a computer (occupying, at the time, an entire room) on the basis of an audience survey. In another, the audience was arrested for singing a song which contravened the provisions of the Industrial Relations Act 1971. The big difference between the audience participation of the early 70s and the projects described at the ICA was the intention of the process. As a form of authorship, audience involvement is part of a democratising procedure (the Tate has a Director of Audiences, but I don’t think it quite means that). In the early 70s, by contrast, audience participation was largely a matter of manipulating theatrical convention in order to create meaning. The fact that, in my play about the Campaign for Nuclear Disarmament, the play could end with a peaceful resolution or Armageddon on the say-so of a machine was making a point about the risks of nuclear escalation, not about the relative importance of different elements in the theatre-making process. Often, participation was involuntary and it was sometimes physically or even sexually threatening. One reason for this was because the attitude to the audience was different. In the 60s and 70s, audiences in the non-commercial theatre were essentially “guilty creatures sitting at a play”. George Devine was notoriously dismissive of the “fashionable assholes” who made up the audience during his glory-years as director of the Royal Court. Probably the most famous German play of the 60s was Peter Handke’s Offending the Audience. Asked about his attitude to those who paid good money to see his early plays, Howard Brenton is reputed to have replied “I want to piss in their eyeballs”. What changed all that was Thatcherism. What happened with Mrs Thatcher’s election in 1979, in culture as in all spheres of life, was a power-shift from the producer to the consumer. Her great political insight was that she could use the market-place to achieve essentially political objectives – in culture as much as in industrial relations she sought to disarm the left by letting the market rip. So, like passengers, patients and parents, playgoers became “customers”, who as we know are always right. The first effect of this was on the high avant-garde – people were no longer prepared to accept that if they didn’t understand something it was their fault. Then, dominated by market demand for more of what the audience liked last time, theatre repertoires became increasingly homogenised. And finally, theatre artists who did shows in the commercial sector brought the audience-friendly ethos of the big musical back into the rehearsal rooms of the subsidized sector. By the end of the 80s, the big question asked of the playwright by directors and actors wasn’t “what are you saying here?” but “will they get this?”. This isn’t to say all contemporary audience participation is purely get-up-and-join-in crowd-pleasing: in shows which involve individual interrogation, the Belgian group Ontroerend Goed uncomfortably blurs the border between public and private. But from soap producers surveying audiences for plot outcomes to audiences voting how a courtroom drama should end, participation that doesn’t involve being embarrassed, abused or crawled over clearly implies a compliment: we’ve been working on this for weeks, but we think you can work out what ought to happen right now. If the risk of traditional, end stage, fourth wall drama is producer elitism, then the danger of audience participation is consumer populism. Our research project into Theatre Spectatorship and Value Attribution started from the observation that it was much easier to measure the impact of theatre events on the participatory arts (particularly when the participants are conveniently assembled in schools, hospitals and prisons). Although we haven’t talked to participatory audiences, it’s clear that their activity is a form of judgement as well as co-authorship; their responses would be different both from those of completely immersed participants and from people sitting silently in rows. But we knew from our own experience that – however passive it may look – those audiences are participating in the event, by vocalising their responses (of course) but, more profoundly, by completing what they are seeing in their minds, relating what they are seeing to their own lives and their experience of the world, questioning a play’s plausibility, speculating about outcomes before they occur. This process generates meaning in the individual spectator’s mind, and has done so since 5th century Athens. Hence we are asking audiences what they expect of shows before they attend them, their immediate responses afterwards and what they retain after time. Direct audience participation is one way of testing the profundity of such silent but active responses, but it’s not the only way. The AHRC research project we are currently running asks people to tell us how they ‘process’ their experiences of being at the theatre. As I process the research work, it is impossible not to review my own theatre-going history. I have been surprised by the extent and number of my memories as I assumed most would have disappeared into the proverbial sands of time. But instead, other people’s reminiscences have acted to catalyze mine—rather like Proust’s famous madeleine that unlocked the taste, texture and smell of a beloved morsel of childhood food. In my case, I think the earliest performance I attended took place when I was around four. It was Puss in Boots, the ballet, probably produced by the San Francisco Ballet although I can’t be certain. What I do know is that so intense was my pleasure and immersion in the show that I immediately created an invisible feline friend for my own life, and talked to him and treated him as real for a very long time after. This might be a typical reaction of only child, which I was, and it signaled the role theatre and performance would play in my solitary childhood—it helped me survive. Along with reading novels, the theatre gave me a chance for vicarious and imaginative experiences that were intense, interesting, and beautiful. ‘I want to be in the world, and of the world, and never just stand aside and watch’. It seemed to me then, and for much of my life, that these words summed up my own aspirations. And although being an academic might be said to involve a fair amount of standing aside and watching, mostly I have lived my life in and of the world. We called that summer theatre programme ‘summer stock’, and it was as rank and amateur as you might imagine a small town high school summer season to be. Yet it took me a long way toward making my peace with adolescence and my own yearnings. It kept me sane; it gave me friends, my first real friends who shared something important with me. Recently, more than fifty years after that summer, I was contacted by someone who had been a part of that time. Mike had played Applegate in Damn Yankees (I had a chorus part) and the theatre had been an anchor and a place of belonging for him as it was for me. We found ourselves with our respective partners in London trading stories of shows we’d seen and loved over the years. He isn’t a performer anymore either; like me, he went in another direction somewhat related to theatre (in his case, into law). But he attends the theatre regularly in New York and Washington D.C. where he lives. We go to see different things now—he still loves Broadway musicals and comedies; I like ‘serious’ dramas and political theatre. But we both still love it with a passion which is partly to do with the foundational experiences of our early years and the imaginative possibilities it brought to both of our small-town lives as youngsters growing up in the early 1960s. When the current public debates about the value of the arts reach my years, I want to say something melodramatic like ‘people need theatre –it saves their lives’. I can’t say that without sounding somewhat hysterical, but I can share how it happened to be the case with my life and some others I know. Janelle Reinelt is Professor of Theatre and Performance at the University of Warwick and a member of the British Theatre Consortium. One of the compelling features of the AHRC project on Theatre Spectatorship and Value Attribution is the invitation to reflect on what kind of memories we take from attending performances and the various ways they become meaningful in our lives. Perhaps the first step in thinking about ‘value’ is to dredge one’s earliest memories of theatregoing and trace the images, sounds, feelings and associations that constellate around them. Like many people, my first experience of attending theatre was the school play, the occasional musical and, in particular, the annual Christmas pantomime. 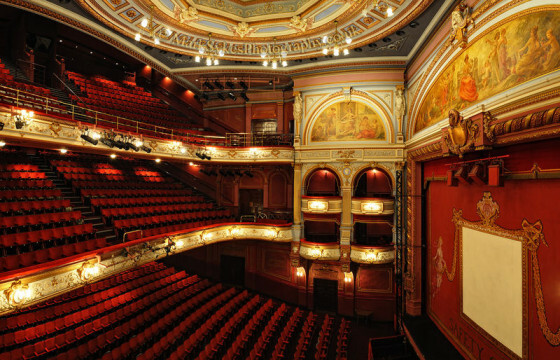 The venue for the latter was the Bradford Alhambra in my home county of West Yorkshire. Built in 1913 and opened the following year, the Alhambra took its name from the famous palace in Granada although, with its impressive dome perched atop steep Corinthian pillars, the Bradford version looks nothing like its sprawling Andalusian namesake. In the nineteenth century, the city of Bradford was the beating heart of the Industrial Revolution, famous around the world for its wool and textile manufacture. The stately design of the Alhambra captures a sense of Edwardian economic confidence mixed with a heady dose of imperial exoticism. Today, exactly one hundred years after its construction, the theatre is the instantly-recognisable landmark in one of Britain’s most vibrant multicultural cities. My grandmother (on my father’s side) was born two years after the Alhambra opened. She spent her working life, from the 1930s onwards, as a weaver in the textile mills at nearby Low Moor. She had retired by the time I became interested in drama as a teenager in the 1980s and I remember, around this time, she told me that she had taken elocution lessons as a girl. She had always guarded this fact quite closely, fearing that others would interpret elocution as snobbish disdain for her Yorkshire roots, but she nonetheless took pride in it. For many working-class families of her generation, elocution was the performance of the aspiration for social mobility but my grandmother was much more invested in elocution as a kind of rudimentary acting, one that enabled her to role-play the polished vowels of Hollywood cinema. For a number of years, at the turn of the 1980s, our shared interest in theatre gathered momentum as the two of us (she in her mid-sixties, me around ten years old) went to see the annual pantomime at the Alhambra. Pantos have been staged at the theatre since the late 1920s and remain part of its DNA. By the early 1980s, the leading players at the Christmas panto tended to be comedians imported from ITV’s Saturday evening schedules and they included high-profile double acts like Cannon and Ball, and my grandmother’s erstwhile favourite Russ Abbot. These stars of ‘Light Entertainment’ were then at the height of their popularity: they had their own TV series and attracted millions of viewers each week. They were also, of course, direct descendants of the Variety performers of the Edwardian era for whom the Alhambra was first built as a ‘Palace of Varieties’ in 1913. Many of the working-class northern comics who appeared in the Bradford pantos started their careers touring clubs and pubs (Cannon and Ball first met as welders in Lancashire) and, on the back of this experience, were able to command the large Alhambra stage. What do I remember of the shows? The bright colours, the immensity of the proscenium arch, bits of physical comedy and sing-along, the inevitable frisson of seeing television ‘personalities’ live on stage. I have a dusty recollection of an impressive beanstalk escalating from centre-stage. My memories of the audience are much more vivid: the giddy terror induced by our proximity to the performers (would we be called onstage? ), the red velvet seats in the stalls and the deafening shouts of spectators. The interior décor of the Alhambra was modelled on Louis XVI, no less, and the high-decibel noise seemed to me wonderfully subversive, like yodelling in Buckingham Palace. Above all, however, a single image comes to mind when I think of the pantos: my grandmother and I are sitting next to each other in the auditorium, the performance is taking place in front of us on the stage, and we’re glancing at each other and smiling. When I recall this image, I see the two of us together but from the perspective of an external observer, an outside eye, so this visual fragment cannot feasibly ‘reproduce’ a moment that actually happened – but yet this image always pops up when I recall my time at the Alhambra. I’m reminded of a comment made by the archetypal psychologist James Hillman in his book, Re-Visioning Psychology. Hillman argues that the study of human consciousness needs to be ‘based in a psychology of image […] a poetic basis of mind […] that starts neither in the physiology of the brain, the structure of language, the organization of society, nor the analysis of behaviour, but in the processes of imagination.’ For Hillman, the mind, like the theatre, is fundamentally concerned with the production of images and these images, whether in dreams or memories, carry symbolic or ‘poetic’ properties when recollected. The impossible image-memory I have retained – of my grandmother watching me, watching her, both of us smiling – is in this sense a distillation, an emblem (or what Hillman calls a ‘fantasy-image’), of this early memory of theatre, which also happens to be a formative experience of spectatorship. And the pleasure I gain from its recollection today, some years after my grandmother’s death, affirms that other people’s (as well as our own) response to theatrical performance is intrinsic to the operation of memory in spectatorship. Theatre is a practice that engages audiences in ‘processes of imagination’ and part of its value accrues from the experience of attending with others, from the mutual participation in a shared imaginary, and from the intensification of a social, in this case family, relationship. Peter Conrad conveys this point in his review of the director Michael Blakemore’s recent memoir, Stage Blood: ‘Theatre is evanescent, yet it can provide us with experiences so intense that we gratefully retain them for the rest of our lives […] it is the impregnable archive of our affections.’ This notion of spectatorship as an evolving ‘archive’ of affective intensities chimes with my own recollection of visiting the Alhambra as a child with my grandmother. I’m excited to see how far the findings of this AHRC project flesh out or challenge Conrad’s conjecture. What do we expect from theatre experiences, and, once we’ve been, what do we remember? Is what we remember at the time conditioned by those expectations? Months or years later, what do we retain? The British Theatre Consortium is currently conducting a study to try and find these things out. Inevitably, those of us who are working on the study have been thinking about own theatre-going past (and present). Aware of the Heisenberg principle (the act of observation changing what’s being observed), we realise that we already seeing the shows that we are studying through the prism of the fact that we are asking people we don’t know questions about them. I’ve been going to the theatre since 1952 so I am particularly interested in what I’ve retained over very long periods of time. Conventional wisdom is bad for playwrights (of which I’m one). Audiences are thought to remember the visual over the verbal, the momentary over the narrative, the music rather than the book. As director Neil Bartlett likes to remark, no one turned to their lover in the romantic darkness of the theatre and whispered “darling, they’re saying our speech”. So does that fit with my childhood and early adult playgoing memories? My first memory isn’t really a memory at all: family legend has it that, when taken to my first theatre play, Beauty and the Beast, I was so terrified by the first entrance of the masked and fearsome creature that I screamed the place down. Eventually, my behaviour became so disruptive that I had to be removed from the auditorium, and as, conveniently, my aunt was administrator of the theatre, I was escorted backstage to meet the now maskless beast in his dressing room, to shake his hand, to watch him put his mask on again, to shake his hand a second time, and to be taken back into the auditorium. Thus reassured, on his next entrance, I screamed the place down. My real memories of theatre shows tend to confirm the conventional view. In my childhood I had a model theatre, and in my teens I wanted (among other dream-on ambitions) to become a stage designer. So I have very strong memories of the sets of the shows I saw in the 60s, from John Bury’s rough, rusty metallic box sets for Peter Hall and John Barton’s Shakespeare’s Wars of the Roses plays, to Sean Kenny’s groundbreaking set for Lionel Bart’s musical Oliver, in which visible lamps hung over a junkyard set on an open revolve. I also, as it happens, remember Kenny’s wonderfully simple set for the Redgrave/Olivier Uncle Vanya, which consisted, on Chichester’s thrust stage, of a single, vast, textured wall, which served for both the outdoor and indoor scenes, I saw the production again at the Old Vic, which is not a thrust stage. In the first act (set outside), the wall remained as it was in Chichester. At the first scene change, two hitherto invisible sidewings of the wall swung a few degrees forward, enclosing and trapping the characters as they moved from the open air into the increasingly claustrophobic interior. I remembered that image much more recently, seeing Rachel Kavanaugh’s 2007 Vanya on the notoriously large Birmingham Rep stage, in which the sets for the four acts retained the stage’s width while reducing its depth, so that the open stage of the first act became a shallow ribbon across the front for the final scene in Vanya’s tiny office/bedroom. So, does my entire bank of theatrical memories consist of sets and scene changes? Certainly, the moment when, on its revolve, the Parisian streets upend and turn into a barricade is one of my most vivid memories of Les Miserables, as is the last scene change in David Hare’s play about the disillusion of post-war Britain, Plenty, in which a dark and seedy, early 60s Blackpool hotel room shatters apart, to reveal a dazzling summer’s day on a French hillside in 1944. So my memories tend to confirm the thesis that we remember the visual and the momentary rather than the verbal and the meaningful. But, hang on a moment. These are all, certainly, potent and sometimes dazzling visual moments, but why do they stick in the memory over others? Why, having been dragged to the Circe du Soleil more times than I care to recall, can I dredge up no recollection of a single act? The answer lies in the work of the 20th century dramatist and director who understood – perhaps better than anyone else – the role of the telling visual image in conveying meaning. Brecht even had a word for it: the gestus. From the telescope which no one ever looks through in the first Florence scene in Galileo, to Mother Courage pulling her empty cart against the direction of the treadmill revolve, Brecht understood that the images help us to process and retain the meaning he wants to convey (indeed, without the meaning, what are they? A piece of scientific equipment and an empty turntable). And, by the same token, the meaning makes the image memorable. So the Plenty scene change sticks in the mind because it goes from the chronological end of the story, with the central character in disillusioned despair, to her moment of greatest hope in the future (the last line of the play, in newly liberated France, is “there will be days and days and days like this”). By assembling the higgledy-piggledy barricade from ordered Parisian architecture, Les Miserables designer John Napier was making the point that the barricade represented a literal upending and reassembly of bourgeois Paris into a place of revolution. Sean Kenny’s Vanya set is a metaphor for the increasing enclosure of the characters. And, in fact, the scene I remember most strongly from Oliver is a scene without any spectacle at all, in which the revolve was still and there was only one figure on the stage. And why is Fagin’s I’m Reviewing the Situation – particularly as sung by the incomparable Ron Moody – the best number in a live performance of Oliver? Because it is about character expressed through narrative, indeed a series of speculative narratives, in which Fagin weighs up his possible future lives beyond the world of crime (the tag line of the chorus being “I think I’d better think it out again”). Verbally, Shakespeare’s Henry VI plays are not among the most obviously quotable, though the fourth play of the tetralogy (Richard III) certainly is, from its first line onwards. Seeing the whole cycle (compressed into three plays) over one day at the RSC in 1963, I particularly remember Peggy Ashcroft’s Queen Margaret, then in her mid-50s, ageing from a young French princess in her late teens to a vengeful ancient during the course of the day: one of the most vivid scenes remaining – in that and other productions – the battle in which she dresses her captured enemy the Duke of York in a paper crown before killing him (gestus, gestus). But the single moment I remember was an invented, monosyllabic line. “Sound drums and trumpets – farewell, sour annoy! For here, I hope, begins our lasting joy”. However, we know that sour annoy is far from over, and that its continuance will be heralded by Richard of Gloucester, at the beginning of the next play, in the most famous opening lines in Shakespeare. Directors have acknowledged this at the end of this play by having Richard actually start the speech (“Now is the winter of our discontent …”) or indeed bark out the first word “Now”. But, in the 1963, Wars of the Roses version, the solution was even crisper. After the triumphalist last scene, Edward leads his court out of the state chamber, their boots clattering across the steel floor. Left behind is Richard (magnetically played by Ian Holm), sitting, alone, at one end of the huge oval council table. Holm turned to the audience, paused, and pronounced a single, dismissive and prophetic monosyllable: “hmmph”. You kind of have to know what’s coming. But, if you do, it’s a wonderfully ironic, defiantly colloquial way of propelling an audience which had sat through six hours of high political drama into the final, climactic episode. For that and all of the above, thanks for the memory.